Happy 87th Birthday, Mr Haynes! Denny Jump (Bellevue, WA, United States) on 13 March 2012 in People & Portrait. I borrowed this image from Drummerworld - I wish I could claim it for myself, but I've got to be honest about this stuff. It's just that I can NOT let this day go by without saluting and saying "Thank You" to Mr Roy Haynes, celebrating his 87th birthday today! And don't I hope I can look this good when I reach 87!! No wonder his band is called "The Fountain of Youth Band" ! Now, pretty much anyone who is a lover of jazz, a fan of drumming, or music, in general, knows this man, who is, in my view, the most energetic, prolific, dynamic, diversified, majestic, magnificent, rapid-firing, smooth-as-silk-with-the brushes, inspiring, amazing drummers ever to come along! So Happy Birthday Mr Haynes - I love you sir! "Roy Owen Haynes (born March 13, 1925 in the Roxbury section of Boston, Massachusetts) is an American jazz drummer and bandleader. 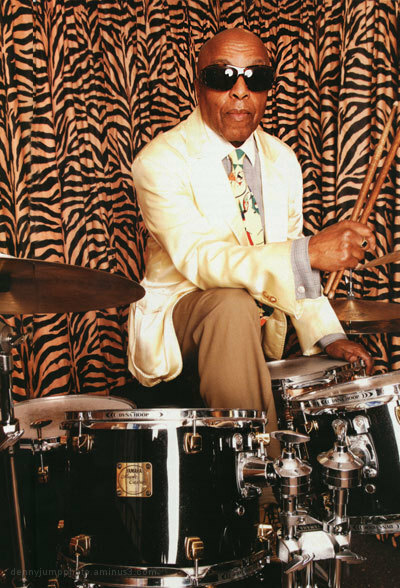 Haynes is among the most recorded drummers in jazz, and in a career lasting more than 60 years has played in a wide range of styles ranging from swing and bebop to jazz fusion and avant-garde jazz. He has a highly expressive, personal style ("Snap Crackle" was a nickname given him in the 1950s) and is known to foster a deep engagement in his bandmates"
87? I want to look as good as he does if I ever be so old! Wow... He looks fantastic indeed ! Wish him a very Happy Birthday. Don't worry Denny, I'm sure you will look good too at 87 :) Have a lovely day, all the best ! @Tamara: I don't think I will look this quite as good as Roy does, but thank you, Tamara ;-) I am really sorry that I have not been able to comment much lately on your blog but I always view...Hopefully I will have better time again soon..Thank yuo so much - hugs dear friend!! He certainly does not look his age ! @Doug: No he does not! Just a stylish and superb physique and a real "monster" on the drums - I mean that in the best of ways! Thak you DOug! @Christine: Dapper is definitely the word! He has always been in excellent shape and therefore appears superb in all that he dons, regardless of the style. So when we watch him play, we are awestruck not just by how he plays and sounds, but how good he looks!! Thanks Dear friend...I hope you are well. Denny, you are man of many interests, with a talent for words. @Julie L. Brown: Thank you so much, Julie - you are very kind to say that. I am truly sorry that I have not been around so much lately to comment, but I visit as often as I can and I am sure that will eventually get better. In the interim, I will still probably need tor really slow down my posts for a while, but I will be hovering around and will keep you advised as to when, and for how long, as soon as I know myself :-) Hugs good buddy! Denny your awareness & appreciation of others sets an example for us all. Thanks. @Williams: You are very kind, sir - I do appreciate that...I hope you are getting re-acquainted with your beautiful home and that the 4 hour time change - on top of the daylight savings switch - is not beating you up too much :-) It sure would me!!! @Gérard Beullac: Thank you, Gerard. A great tribute for a great man! ALl the best to you, sir! Sorry I have not been around lately! what a life to look back on, what a distinguished career !! so very appropriate and considerate of you, denny, to think of posting this tribute! @franz: It really is a great shot isn't it? I liked it too...I just hope the folks at Drummerworld don't mind...Thanks very much, Franz. I have been listening-to and loving Haynes as far back as the 50's when I was 11 or 12 and always was just so energized and thrilled by his style and demeanor. He is truly a gianr to me and many others, I know! Thanks Franz! super hommeage et compo de cet artiste très belle iamge. A cool portrait. nice image. It's so interesting - I was just thinking about you and your drumming yesterday. Funny. A cool tribute to this musician. Fantastic post and tribute to one of your favorite musicians! Spread the music! I share a birthday with a very important guy! Happy Birthday to us! @LauraS: Well, Happy Birthday indeed, Laura ;-) ANd Man More ;-) Cheers! A wonderful testament to a marvelous man ... thank you for sharing, Denny! Wow, still going strong, eh? Wonderful tribute to a marvelous musician, Denny! Hey, music is SO important and great players have to be celebrated, bravo !